What to do with dead protected cells? I just happen to have half a dozen dead protected cells – 2xold Trustfire flame 26650 and 4xSamsung ICR18650 26FM. They probably got drained out in their respective lights… not sure whether parasitic drain or used to depletion. Anyway, they just don’t register on my Opus BT-C3100 charger, like there is no cell at all. What should i do? Trash them? Most probably the protection circuit has tripped, though most cells should be fine. Provided that you don’t have any adjustable PSU in hand, ripping the protection circuit off the cells should be the most wise solution. Alternatively, you can split the end of a USB cable, find the two power lines and after having it connected to a regular 5V phone charger, you can connect the lines to the cell for 5 seconds hoping to revert the protection circuit. Just be cautious regarding the polarity of your cables. I don’t know about the Opus, but only some of my 18650 chargers will reset a tripped protection circuit. Some of the Xtar chargers will reset dead cells. Take a known good cell and put it nose to nose with the 0v cell and then short the negative terminals. This will reset them, if that’s all that’s needed. Absent this working, you can strip the wrapper and remove the protection circuit, metal strip and then re-shrink-wrap them. See if those don’t work. Obviously, be careful removing the PCB and metal strip. Make sure the good cell is fully charged, best to use a non-protected one. If the bad cell is properly flat, you may need to keep the two cells connected in parallel for a while, until the bad one has picked up enough charge/voltage to keep going. Best not do this indoors, just in case. Chargers that won’t re-set a tripped protected cell usually won’t charge a low voltage LiIon either, but brute force can often resurrect them satisfactorily. Or a bench PSU set with suitable voltage and current limits. SkyRC MC3000 will reset a tripped protection circuit. I’m just going to throw this out there, but if the OP doesn’t know of the trick I posted, I’m going to guess that he doesn’t have a SkyRC MC3000 handy? Some chargers will reset, some won’t, like my Xtar WP2 II. All you need is a known good cell, charged up and a paper clip. If you have a monkey handy, to hold the two cells nose to nose, while one shorts them, all the better. I know what you mean, but when you say to hold two cells together nose to nose while one shorts them, I feel a little uncomfortable doing that and maybe others do too, I don't know. I know what you mean, but when you say to hold two cells together nose to nose while one shorts them, I feel a little uncomfortable doing that and maybe others do too, I don’t know. If you truly feel that way and I suspect that some do, then in my opinion, you shouldn’t be ‘playing’ with lithium-ion cells. Honestly, how hard can it be? I wouldn’t recommend something that’s going to blow off your face, or burn down your home, despite some members’ opinions of me. lol. Something about "two batteries" and "shorting" that don't go together well in my mind. lol. Something about “two batteries” and “shorting” that don’t go together well in my mind. We all have to learn. I was new to li-ions 6 years ago and approached them with trepidation, much like you are now. You will be educated at some point down the road and this will be second nature. Like I said, I’m not out to get anybody, or cause harm to them. Nose to nose, taping them together if you have no monkey handy and then quickly…say a second—one Mississippi and if the 0v PCB is going to reset, it will. I’m only here to help and to piss off a few others. Still learning about lithiums, thanks for that method to reset them. Will try it one day as a good backup method. I guess you mean to connect the two cells in parallel (nose to nose) just a second? BTW: i used a SRK body to hold the cells and a paper clip to connect the positive terminals just a second. The cells came out at 2.75V in the charger and quickly reached 3V as soon as they started charging (at 500mA). 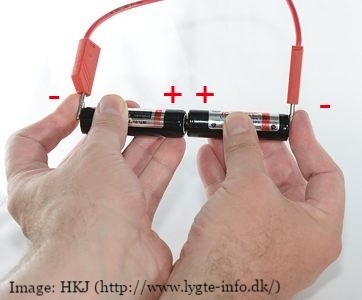 Put one charged cell and the dead, protected cell lying one above the other, with both cells’ end (+ ) side on the same side, then form a letter U of the stripped paper clip. Then contact the U-shape ends of the clip on both the ( – ) and another U-shape ends on the ( + )…do this for just a perhaps a second at most. This will activate the protection circuit back into ‘active’ mode (assuming the PCB protection is still functioning). Then, using your dmm, you may check the protected’s voltage…it usually trips off at 2.5v and below. Have done it numerous times and it has always worked. Although i could save those six cells, thanks to the above mentioned trick, i’m a bit worried about all the lights i gifted with protected cells… If you manage to drain them so that the PCB protection trips (no LVP on the light, parasitic drain or self discharge over a couple years? ), you may end up with a cell that won’t charge back at all! I’d be a little concerned about reviving a drained cell by shorting it together with a fully charged cell. The voltage difference is as much as 4.2v. Coupled with the low resistance of lithium-ion cells, and you could have a sizable amount of current going to charge the drained cell. This may be far more than the cell is rated for, and especially bad for cells below 3v when the charging current should be kept low. Try it for a very brief time, if you do that. Better would be to charge it with a drained cell, close to 3.0v. The charging current would be much less in that case. Or use a couple of alkaline AA cells in series for a total of 3.0v, and the alkaline’s internal resistance will certainly keep the charging current low. And, keep in mind that cells that have drained below 1.0v may no longer be safe. If this is just a protection circuit trip, then the techniques mentioned in the prior posts may work, as long as you don’t keep the cells shorted for very long. I think I’d still rather it be done with a charger that will reset protection circuits, since it will be properly current-limited. You really shouldn’t be ‘gifting’ inexperienced people li-ion flashlights, cells, or chargers. That’s what AA, AAA, C and D alkaleaks are for. Many PCBs will trip at around 2.8v, some I’ve read even trip at a lower 2.4v, which even for lithium-cobalt, isn’t catastrophic. The problems arise when li-co (rarer these days) cells are left in a completely discharged state for long enough periods of time that copper ‘whiskers’ dendrites form on the separator and create a short upon charging. This might have been a worry 5-10 years back, but not so much now. I get the argument but when the cell is inside a USB (or else) rechargeable light, it’s far less of a worry. A bit like the dangerous amount of gasoline inside a car tank. It usually doesn’t blow up and we acknowledge the risk in the face of convenience. I get the argument but when the cell is inside a USB (or else) rechargeable light, it's far less of a worry. A bit like the dangerous amount of gasoline inside a car tank. It usually doesn't blow up and we acknowledge the risk in the face of convenience. That being said, I'm always a little nervous when I replace an electric fuel pump in my car's gas tank.